FLAGSTAFF, Arizona— In the wake of the toxic spill in the Animas River earlier this month, tribes, local governments and environmental groups today petitioned the Department of the Interior and Department of Agriculture to reform outdated mining rules on the federal lands they manage. The 74-page petition requests four key changes to federal mining regulations to help protect western water resources from future environmental disasters like the recent Gold King Mine spill in Colorado, and ensure that mine owners cannot simply walk away from existing and inactive mines. "The Hualapai Tribe supports the petition to make long overdue changes to the mining regulations,” says Chairwoman Sherry Counts of the Hualapai Nation. “Indian tribes have always viewed themselves as stewards with an obligation to take care of the earth that has provided for them. The Animas disaster only accentuates the urgency for federal agencies and the mining industry to do a much better job of protecting our precious land, air, and water." The petition, submitted under the federal Administrative Procedure Act, requests that the Bureau of Land Management and U.S. Forest Service reform existing mining rules by: limiting the lifetime of a mine permit, imposing enforceable reclamation deadlines and groundwater monitoring requirements on mines, requiring regular monitoring and inspections, and limiting the number of years that a mine can remain inactive. The threat that uranium mining poses to the Grand Canyon prompted the support of many regional governments for regulatory reform. Uranium mines in the Grand Canyon region are operating under environmental reviews and permits from the 1980s, with no requirements for groundwater monitoring once mining is complete. Like the abandoned gold mine that spilled wastes into the Animas, old and new uranium mines must be addressed before they contaminate the Colorado River and its tributaries. 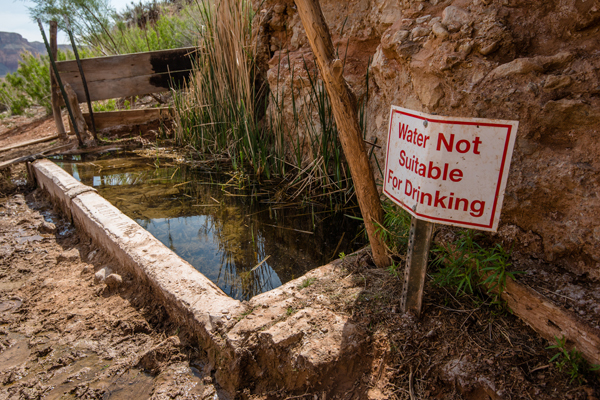 Along with the threats posed by existing mines, there are hundreds of thousands of abandoned mines in the United States that pollute an estimated 40 percent of streams in the headwaters of western watersheds. Most of these toxic mines, including the Gold King Mine, exist because the 1872 Mining Law, still the law of the land, didn’t require cleanup. Today’s petition, submitted under the federal Administrative Procedures Act, requests four changes to existing federal mining regulations: (1) limit the duration of approved plans of operations to 20 years, with the option to apply for 20-year renewals; (2) require supplemental review under the National Environmental Policy Act and National Historic Preservation Act, as well as a new approval for any mining operation that has been inoperative for 10 or more consecutive years; (3) require the BLM and Forest Service to regularly inspect mining operations, and mining operators to regularly gather and disclose information regarding the status and conditions of those operations, during non-operational periods; and (4) impose deadlines for commencing and completing reclamation activities once a mining operation ceases, and impose long-term monitoring requirements for surface water and groundwater quality. The petition was prepared by the Stanford Environmental Law Clinic and is supported by the Havasupai Tribe (Arizona), the Hualapai Tribe (Arizona), the Zuni Tribe (New Mexico), Coconino County (Arizona), and San Miguel County (Colorado), as well as more than a dozen national and regional environmental organizations including the Grand Canyon Trust, the Center for Biological Diversity, Earthworks, the Sierra Club, the Information Network For Responsible Mining, Uranium Watch and others, representing millions of people who treasure our public lands and waters. Dr. David Kreamer's op-ed on the dangers of uranium mining near the Grand Canyon in the Guardian.